Polotsk (Russian: По́лоцк; Belarusian: По́лацк, translit. Polatsk; Lithuanian: Polockas; Polish: Połock) is a historical city in Belarus, situated on the Dvina River. It is the center of the Polotsk District in Vitsebsk Voblast. Its population is more than 80,000 people. It is served by Polotsk Airport and during the Cold War was home to Borovitsy air base. The Old East Slavic name, Polotesk, derives from the Polota River, which flows into the Western Dvina nearby. The Vikings rendered that name as Palteskja. Polotsk is one of the most ancient cities of the Eastern Slavs. The Primary Chronicle (a history of Kievan Rus' from about 850 to 1110, compiled in Kiev about 1113) listed Polotsk in 862 (as Полотескъ, /poloteskŭ/), together with Murom and Beloozero. However, an archaeological expedition from the Institute of History of the National Academy of Sciences of Belarus suggests that Polotsk existed in the first half of the 9th century. The first known prince of Polotsk was Rogvolod (ruled 945–978). He had two sons and a daughter named Rogneda. Rogvolod promised Rogneda to the prince of Kiev, Yaropolk, as a wife. But Yaropolk's brother, Vladimir, had attacked Polotsk before Yaropolk came. He killed Rogvolod, his wife and sons, and married Rogneda. Vladimir and Rogneda had five children and the eldest of them, Izyaslav, became Prince of Polotsk (ruled 989-1001). Between the 10th and 12th centuries, the Principality of Polotsk emerged as the dominant center of power in what is now Belarusian territory, with a lesser role played by the Principality of Turov to the south. It repeatedly asserted its sovereignty in relation to other centers of Kievan Rus, becoming a political capital, the episcopal see and the controller of vassal territories among Balts in the west. Its most powerful ruler was Prince Vseslav Bryachislavich, who reigned from 1044 to 1101. A 12th-century inscription commissioned by Vseslav's son Boris may still be seen on a huge boulder installed near the St. Sophia Cathedral. For a full list of the Polotsk rulers, see the list of Belarusian rulers. In 1240, Polotsk became a vassal of the Lithuanian princes. The Grand Duke of Lithuania Vytenis annexed the city by military force in 1307, completing the process which the Lithuanian princes had begun in the 1250s. Polotsk received a charter of autonomy guaranteeing that the grand dukes "will not introduce new, nor destroy the old". It was the earliest to be so incorporated into the Grand Duchy of Lithuania. By doing so, the Lithuanians managed to firmly grasp the Dvina trade route in their hands, securing an important element for the surrounding economies. Magdeburg law was adopted in 1498. Polotsk functioned as a capital of the Połock Voivodship of the Polish-Lithuanian Commonwealth until 1772. Captured by the Russian army of Ivan the Terrible in 1563, it was returned to the Grand Duchy of Lithuania just 15 years later. It was again captured by Russia on 17 June 1654, but recaptured by Poland-Lithuania on 30 October 1660 during the Russo-Polish War (1654-67). In 1773, with the First Partition of Poland, Russia seized Polotsk (then Połock) as part of the Russian Partition of the Polish–Lithuanian Commonwealth. Since the Russian Empress Catherine II did not acknowledge the Papal suppression of the Society of Jesus (1773–1814), the Jesuit branches in these lands were not disbanded, and Połock became the European centre of the Order, with a novitiate opening in 1780, and with the arrival of distinguished Jesuits from other parts of Europe who brought with them valuable books and scientific collections. Jesuits continued their pastoral work and upgraded the Jesuit College in Polotsk (opened in 1580 by decree of the Polish king Stefan Batory, with the Jesuit Piotr Skarga (1536-1612) as its first rector) into the Połock Academy (1812–1820), with three faculties (Theology, Languages and Liberal Arts), four libraries, a printing house, a bookshop, a theatre with 3 stages, a science museum, an art gallery and a scientific and literary periodical, and a medical-care centre. The school was also the patron of the college in Petersburg, the mission to Saratów and an expedition to Canton. When in 1820 pressure from the Russian Orthodox Church influenced the Russian Emperor Alexander I to exile the Jesuits and to close the Academy, there were 700 students studying there. The Russian authorities also broke up the Academy's library of 40,000-60,000 volumes, the richest collection of 16th- to 18th-century books - the books went to St. Petersburg, Kiev and other cities, 4000 volumes (along with books from other closed Jesuit schools) going to the St. Petersburg State University Scientific Library. That period[which?] of warfare started the gradual decline of the city. After the first partition of Poland (1772), Polotsk became reduced to the status of a small provincial town of the Russian Empire. During the French invasion of Russia in 1812 the area saw two battles, the First Battle of Polotsk (August 1812) and the Second Battle of Polotsk (October 1812). Polotsk came under occupation by the German Empire between 25 February 1918 and 21 November 1918 in World War I, by Poland between 22 September 1919 and 14 May 1920 in the Polish–Soviet War and by Nazi Germany between 16 July 1941 and 4 July 1944 in World War II. Polotsk functioned as the center of Polatsk Voblast between 20 September 1944 and 8 January 1954. A reorganisation of the area between Vitebsk and Molodechno voblasts left Polotsk part of the former. The city's Cathedral of Saint Sophia in Polotsk (1044–1066) was a symbol of the independent-mindedness of Polotsk, rivaling churches of the same name in Novgorod and Kiev. The name referred to the original Hagia Sophia in Constantinople and thus to claims of imperial prestige, authority and sovereignty. The cathedral had been ruined by the troops of Peter I of Russia. Hence the present baroque building by Johann Christoph Glaubitz dates from the mid-18th century. Some genuine 12th-century architecture (notably Transfiguration Church) survives in the Convent of Saint Euphrosyne, which also features a neo-Byzantine cathedral, designed and built in 1893—1899 by Vladimir Korshikov. Cultural achievements of the medieval period include the work of the nun Euphrosyne of Polotsk (1120–1173), who built monasteries, transcribed books, promoted literacy and sponsored art (including local artisan Lazarus Bohsha's famous "Cross of Saint Euphrosyne," a national symbol and treasure lost during World War II), and the prolific, original Church Slavonic sermons and writings of Bishop Cyril of Turaw (1130–1182). The city has produced players for the Belarus national bandy team. In October 2011 a team planned to participate in the Russian Cup in rink bandy, but did not after all. ^ "Geography, Belarus | Belarus.by". www.belarus.by. Retrieved 2019-02-15. Wikimedia Commons has media related to Polotsk. 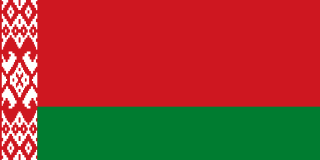 At the top level of administration, Belarus is divided into six regions and the city of Minsk, which has a special status being the capital of Belarus. Minsk is also the capital of Minsk Region. Rogneda of Polotsk (962–1002) is the Slavic name for Ragnhild, a Princess consort of Rus'. She was the daughter of Ragnvald came from Scandinavia and established himself at Polatsk in the mid-10th century. Saint Euphrosyne of Polotsk was the granddaughter of a prince of Polotsk, Vseslav, and daughter of Prince Svyatoslav of Polotsk. She is one of the 15 patron saints of Belarus, whose lives are celebrated in the Belarusian Orthodox Church, on the first Sunday after Pentecost, a feast that was instituted in the year of her canonization in 1984. Vseslav of Polotsk or Vseslav Bryachislavich, also known as Vseslav the Sorcerer or Vseslav the Seer, was the most famous ruler of Polotsk and was briefly Grand Prince of Kiev in 1068–1069. Together with Rostislav Vladimirovich and voivode Vyshata, they created a coalition against the Yaroslaviches' triumvirate. Polotsk's Cathedral of Holy Wisdom is one of the most enduring monuments on the lands of modern Belarus and dates to his 57-year reign. Połock Voivodeship was a unit of administrative division and local government in the Polish-Lithuanian Commonwealth since the 15th century until the partitions of Poland in 1793. Boris Stones, also called Dvina Stones, are seven medieval artifacts erected along the bank of the Western Dvina between Polotsk and Drissa, Belarus. They probably predate Christianity in the area, but were inscribed in the 12th century with text and an image of Christ. The largest of the stones is 17 metres in circumference. This is a list of topics related to Belarus. Those interested in the subject can monitor changes to the pages by clicking on Related changes in the sidebar. The Cathedral of Holy Wisdom in Polotsk was built by Prince Vseslav Briacheslavich (r.1044–1101) between 1044 and 1066. It stands at the confluence of the Polota and Western Dvina Rivers on the eastern side of the city and is probably the oldest church in Belarus. The Battle on the Nemiga River was a battle of the Kievan Rus' feudal period that occurred on March 3, 1067 on the Niamiha River. The description of the battle is the first reference to Minsk in the chronicles of Belarusian history. Gleb Vseslavich was the prince of Minsk between 1101 and 1119. During his reign Minsk was at war with Kiev and Polatsk. He started the Minsk branch of Prince of Polotsk as son of Vseslav the Seer. The Archeparchy of Polotsk(-Vitebsk) was an eparchy of the Ruthenian Uniate Church in the Polish-Lithuanian Commonwealth from 1596 to 1839.